This past weekend, we were in San Francisco to see Dark Star Orchestra and spent two days exploring the city, visiting not the same old tourist destinations, but the secret or hidden San Francisco gems few know about — and the Lyon Street Steps were our first stop. The Lyon Street Steps, also called the Lyon Street Stairs, is a 288 step hidden staircase in San Francisco. Tucked between the expansive Presidio on the west and the Pacific Heights neighborhood on the east, this impressive set of stairs is a favorite of fitness buffs and exercising locals, but is virtually unknown to tourists. We arrived at 8:30 am on an incredibly clear day and had no problem finding a parking spot at the top of the Lyon Street Steps on Broadway. It was early enough that we beat most of the fitness buffs. 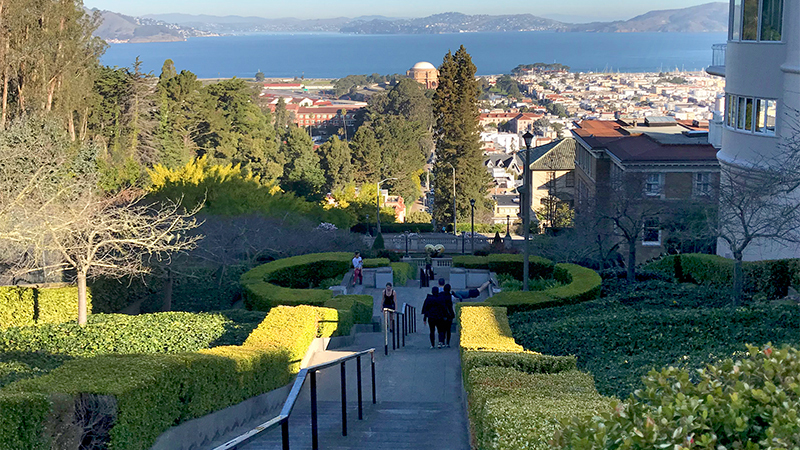 From the top of this secret San Francisco staircase, we had amazing views of the Palace of Fine Arts and the Marina District, Alcatraz Island and Angel Island, the rolling East Bay hills, and the sparkling blue San Francisco Bay. After snapping some photos, we made our way to the bottom and back up to the top, ogling the magnificent homes and immaculately manicured gardens. Going down the secret staircase was easy and fairly quick, and we only had to make way for a few runners. I did stop several times to snap photos of the beautiful flowers. Climbing the steep staircases was a completely different story. It kicked our butts and was a bit humbling to see some runners lap us! What I did love though was seeing other families with kids of all ages up early to walk the stairs together. By the time we reached the top again, every parking spot was taken, groups of runners and stair climbers were huddled together in the street, yoga mats were spread out on the sidewalk, and personal trainers were taking their clients through reps of squats. The stunningly gorgeous neighborhood of Pacific Heights sits west of the staircase, at one of the highest locations in the city, and features some of the largest homes in San Francisco. In fact, the three blocks on Broadway Avenue between Lyon Street and Divisadero Street is known as Billionaire’s Row. It used to be called Millionaire’s Row, but the small stretch of homes earned a new name when several tech-industry founders purchased homes. Here you can find the homes of Yelp CEO Jeremy Stoppelman, Oracle Founder Larry Ellison, author Danielle Steele, Apple executive Jony Ive, Gordon Getty (son of J. Paul Getty), Mark Pincus creator of Farmville, Mimi Haas of the Levi Strauss Haas family, and David Sacks one of the founders of PayPal. The home at Lyon Street and Vallejo Street with a wide landing, beautiful garden beds, and a “Heart of San Francisco,” is owned by U.S. Senator Dianne Feinstein. When she is at home, a uniformed security guard will be present on the landing. At the bottom of the Lyon Street Steps, you’ll find the “Princess Diaries” house. The Lyon Street Steps are located on Lyon Street in the Pacific Heights neighborhood of San Francisco, California 94115. Parking can be found at the bottom of the staircase at Lyon Street and Green Street, and at the top of the staircase at Lyon Street and Broadway Street. To avoid the hordes of fitness freaks and runners, arrive early in the morning before they descend upon the stairs, or later in the afternoon when they’re done working out for the day. Historic Presidio Park sits west of the Lyon Street Steps. The 2.6 mile Mountain Lake Trail leaves from the Broadway Gate at the top of the Lyon Street Steps and leads all the way to Baker Beach. Jennifer Bourn is founding partner at Bourn Creative, a full service design and development company specializing in WordPress. With twenty years experience, she is an award-winning designer who consults on branding, website strategy, and content strategy. Jennifer speaks often, delivering workshops and keynote presentations, coorganizes the Sacramento WordPress Meetup and WordCamp Sacramento, and writes often about freelancing, client services, blogging, marketing, websites, and branding. Some of the links in the post above are “affiliate links.” This means if you click on the link and purchase the item, I will receive an affiliate commission. Regardless, I only recommend products or services I use personally and believe will add value to my readers. I am disclosing this in accordance with the Federal Trade Commission’s 16 CFR, Part 255: “Guides Concerning the Use of Endorsements and Testimonials in Advertising.” Also, I am a participant in the Amazon Services LLC Associates Program, an affiliate advertising program designed to provide a means for us to earn fees by linking to Amazon.com and affiliated sites. Drop your email below and get my latest recipes, adventures, and candid musings on juggling work and life. Seriously. You'll make my day and what's one more email, really?